Vivos los llevaron vivos los queremos. In México many people have disappeared and have died during the unknown civil war (2006 – today). 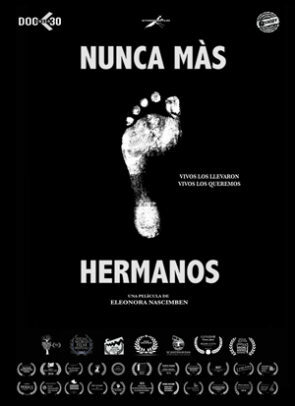 “Nunca Màs Hermanos” was presented in over 40 countries around the world during the first year of distribution, winning several prizes and special mentions such as best documentary, best opera prima, best director, best short, an audience award and a recognition for the originality of the narrative structure. In India the government chose it to be screened at schools and universities with the aim of raising awareness of the new generation on current issues. The director Toni Navarro during the Festival de Cine y Derechos Humanos de Madrid included the movie in an itinerant exhibition organized in collaboration with international human rights festivals that will take place during 2019.